Have you ever asked yourself why you are on planet Earth? And what the ultimate purpose for your life might be? Well, Jack Canfield asked himself this very question, and he came up with a surprising answer - part of which included a vision revealing that he is part of a 'Golden Motorcycle Gang' - a gang whose intent is to have fun, but also to make significant contributions to the wellbeing of humanity. During a joyful dinner many years ago in Santa Barbara, California, Jack told his friend William Gladstone about the Gang. Upon hearing this account, William had an epiphany that Jack's story held a powerful underlying truth not only explaining Jack's true purpose, but William's as well. For more than ten years, William encouraged Jack to write a book based on the story of the Gang, so they have now collaborated on this work to show you its relevance to this critical moment in the history of human civilisation... and also to you, personally. As you read, you will be introduced to some of the extraordinary members of the Golden Motorcycle Gang, including visionary thinkers such as Barbara Marx Hubbard, the originator of the concept of Conscious Evolution. The mystery and adventure inherent in this book reveals that there is now the opportunity for all of us on planet Earth to make a quantum leap in real time toward choosing the actual course of our evolution. Along the way, we are meant to experience the joy that comes from recognising who we really are. 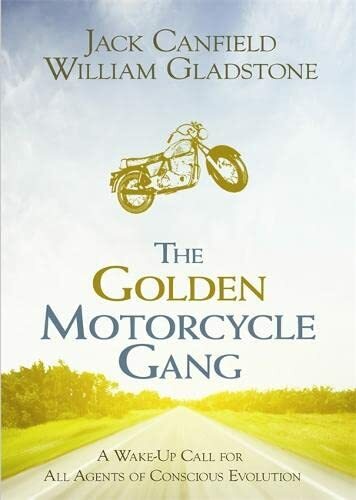 Perhaps, as you embark on Jack's journey along with him ... you will find that you are also a member of the Golden Motorcycle Gang! So get ready for the adventure of your life! Jack Canfield is the co-author of the #1 New York Times best-selling Chicken Soup for the Soul series, which has sold more than 115 million copies in 47 languages. Known as America's #1 Success Coach, he is also the author of The Success Principles, The Aladdin Factor, Dare to Win, The Key to Living the Law of Attraction and The Power of Focus. Jack is a featured teacher in the movies The Secret and Tapping the Source; and has appeared on more than 1,000 radio and television programs including The Oprah Winfrey Show and the Today show. Jack is the CEO of the Canfield Training Group and the founder of the Transformational Leadership Council. As an author, William Gladstone is best known for his international bestseller The Twelve. He is also the co-author of Tapping the Source and co-producer of the film of the same name. William has an undergraduate degree from Yale University and a graduate degree in cultural anthropology from Harvard University. As a literary agent and the founder of Waterside Productions, William represents luminaries such as Eckhart Tolle, Thom Hartmann and Neale Donald Walsch. He is a trustee of the International Club of Budapest and has served as the founding alumni president for Schoolyear Abroad.